In celebrating 75 amazing years I decided to do something entirely new and exciting that involved myself and the “Sturgis Rally” community. This painting depicts the reason why we all take time off from our busy lives to celebrate riding motorcycles and spending time with our friends and family. Everyone that came into my gallery was welcomed to be a part of the Sturgis 75 art piece. Through this interactive piece it was with great honour that I was able to share my knowledge and experience in the artistic field. I gave them the paintbrush and guided them in helping me create a vivid depiction of the world’s greatest bike rally. I am extremely excited to share with you all the finished piece. Everyone in Sturgis made me feel welcomed, like part of their family. 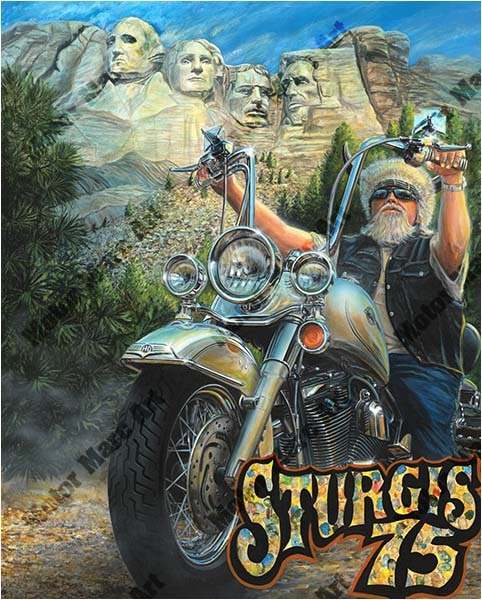 With a stroke of a brush, and a thumbprint of paint on a canvas you will all be a part of Sturgis Rally’s 75th anniversary history and helping children fight against cancer. Thank you to everyone that came into the gallery, and to those who participated in the interactive Sturgis 75 art piece. Most of all thank you to everyone who made me feel like Sturgis was my home away from home.